This is a crossover option for applications where you want to combine the usability and real-time processing of a microcontroller with the high performance and multimedia functionality of an application processor. This is a great option when microcontrollers no longer offers sufficient performance and there are reasons to not fully transfer into the Linux universe with an application processor. 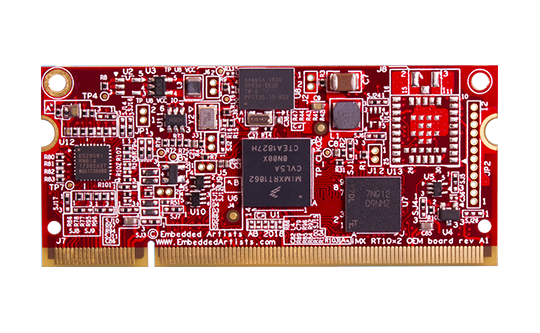 The i.MX RT1062 has the most comprehensive multimedia functionality among our microcontroller modules including great audio, 2D video accelerator, pixel processing and camera sensor. The module also offer low power consumption and a wide range of advanced connectivity options such as Wi-Fi and Bluetooth. The iMX RT1062 OEM board is available in industrial temperature range, -40 to +85 degrees Celsius. The industrial (temperature range) version is suitable for always-on applications.